I love Autumn. There’s not much Fall to be had in Austin, but each and every year I try to will this season to occur. The leaves don’t chain color, unless you count the grass dying, the weather barely cools, but I still make my house smell like synthetic pumpkin, I wear layers in earth tones, and I make squash. Lots and lots of squash. In an attempt to make squash more than a side dish, I decided to make a Spaghetti Squash Alfredo. Creamy without being heavy, filling without being packed with carbs. To lighten the sauce, I skipped the usual heavy cream, cut back on the butter, and made a roux instead. Preheat your oven to 400 degrees. 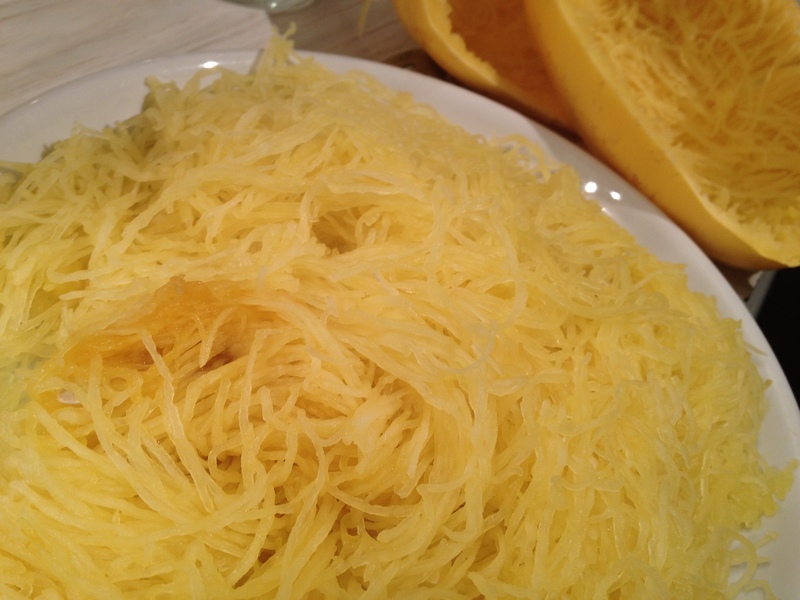 Cut the spaghetti squash in half lengthwise, and scrape out the seeds. In a 4 sided cookie pan or large pyrex fill with enough water to fill about 1/4-1/2 inch up the sides. Place the squash (which at this point will look nothing like spaghetti) face down into the water. 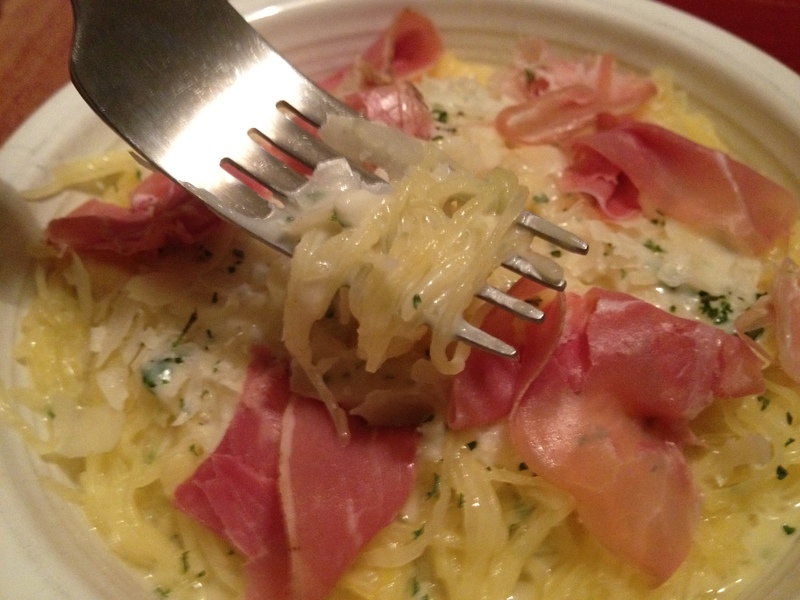 Roast the spaghetti squash for 35-45 minutes or until tender. I like my pasta al dente, so I took the squash out at 35 minutes. The sauce comes together quickly, so make this no more than 10 minutes before the squash needs to come out. Melt the butter in a large sauce pan over medium heat. Once melted, whisk in the flour until you make a paste of even consistency. Add the milk and chicken stock or wine, whisking to incorporate. Add the garlic and let simmer for about 3 minutes, whisking periodically. Sprinkle in the parm and the garlic powder, whisking to combine. If the alfredo sauce seems to thick, add chicken stock or white wine a TBSP at a time. As it sits and simmers it will thicken, so be sure to whisk periodically. It is best, however, to make the sauce a little thick because the squash does contain a lot of liquid naturally and that will moisten the sauce once tossed together. Just before serving, whisk in the lemon juice for brightness. You can also sprinkle the lemon juice directly over the squash prior to topping with sauce if preferred. Getting back to the squash, once done roasting, remove from cookie sheet or pyrex and let cool about 5 minutes. Wrapping the back of the squash in a tea towel (the side with the skin on it) lightly separate the innards of the squash with a fork. I stuck the tines of the fork into the squash meat and gentle twisted, revealing the meat to be spaghetti-like. Once the squash meat is cleaned out of the skin, place your “spaghetti” into a paper towel lined colander in the sink. The one draw back to this dish is that the squash contains a lot of moisture and you want to try to remove some of that prior to serving, just so the meal doesn’t get watery. Once the sauce is done or the squash has drained a bit in the colander for 5 or so minutes, which ever comes first, place the spaghetti squash into a large bowl and toss with the sauce, reserving about 1/4 of alfredo for topping if desired. Plate topping each serving with a little extra sauce and a small sprinkling of parsley. I also topped mine with a shredded slice of prosciutto, but sautéed chicken or shrimp would also be perfect as well to add a healthy and light punch of protein. I really couldn’t detect much of a difference in flavor between the squash and regular spaghetti at all. It was a wonderfully flavorful Autumn dinner, without weighing us down, whether or not Fall was actually happening outside. This entry was posted in Food, Humor, Recipes and tagged affordable, alfredo, atkins, autumn, delicious, diet, dinner, easy, fall, family, light, low carb, side, vegetarian.